Is this business recession proof? Pets are family members and they play an important role in people’s lives. It’s especially true in hard economic times. A Ben’s Barketplace model supports its customers with fantastic healthy and preventative options to increase their longevity. What type of marketing software will I receive? At Ben’s, we have a proprietary marketing and analytics platform that enables each franchise owner cloud based access to all your marketing information. From traffic sources, social media metrics, and phone call metrics, to lead flow information. Everything you need at your fingertips. How long does it take to have a store up and running? This timeframe can vary from location to location. Our goal is to have your store open in 6-8 months. How much money can I make owning a Ben’s Barketplace? How much does it cost to open a Ben’s Barketplace? The average investment to get fully up and running is approximately $189,800 to $352,050. This includes the franchise fee of $45,000, store build-out costs, training expenses, your first 3 months of rent, furniture, signage, computer equipment, inventory and supplies, initial advertising and grand opening costs, three months of living costs and other expenditures to get your new business open! We will negotiate the specific size of your Protected Territory based upon the population density, and we will use commercially reasonable efforts to grant only one license to a Franchise Owner for every 100,000 people in a designated geographical area, but the actual size of the Protected Territory will depend upon the population density in your area. We will use the most recent population information available in the U.S. Census Data, or other population statistical sources of our choosing to determine populations. What Is The Average Store Size? We strive to achieve a store location from 1,500 sq. ft. to 3,000 sq. ft. These are typical square footages. We recommend the largest affordable space for ongoing growth. 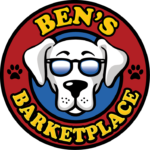 Franchise Owners in the Ben’s Barketplace organization pay a monthly licensing fee equal to 5% of gross sales. The fee entitles you to continued use of the Ben’s Barketplace name and trademarks, access to our operating systems, new product development, ongoing business consulting and other benefits that come along with being a franchise owner in the Ben’s Barketplace brand. Is There Support For The Construction of My New Location? Of course there is! Ben’s Barketplace Corporate has a talented staff with years of experience in finding the best vendors for creating affordable yet stunningly designed stores. We help you every step of the way! Our initial training is conducted in our corporate Roseville, California, store for one week. We invite you and up to two of your managers to attend and complete the training program, where you will learn how to successfully run every element of your Ben’s Barketplace business. How Is The Brand Marketed In Each Location? Currently, the corporate marketing account pays for advertising designs for use in items such as in-store POP materials, shopping bags, brochures, social media Management Company, gift card materials and the materials required for the customer frequent buyer programs and in store app. No. But, you do need to have a strong love for cats and dogs and an incredible work ethic for your success! Do I Need To Be In My Store Every Day? To begin with, it’s important for new owners to begin full-time, learn the business, lead the staff and build the community awareness before moving onto a more part-time role. You are the success of your store.